Navajo crafted dream catcher decoration using dyed leather, sinew wax for the web, feathers and plastic beads. Measures 2" diameter and dangle about 8" long from loop to feather tip. 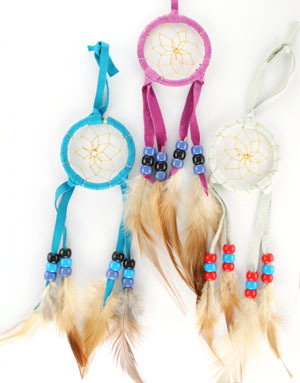 **Please note that these dreamcatchers come in assorted colors and lengths will be different. You may not receive what is pictured on the web. Crafted by Tatania Yazzie. ***Currently available in pink, tan, brown, maroon, navy blue, black and beige, white, red, green, and peach, *** Choose color(s) when ordering or let us choose for you.